Join Princess Alara, her guard-in-training Siptah and their two human friends, Kate and Emma, on their final adventure together in a mystical world on the edge of our own. When Princess Alara is informed Manu has been struck by a deadly fever, she is told to find Aker, who can provide an antidote. But when they arrive in Bakhu they are told Aker is nothing but a children’s story, a myth, and are turned away. 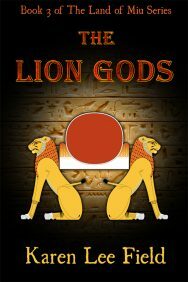 Alara believes differently and she and her friends immediately set out on a journey filled with peril to find the Lion Gods, the Chosen One, and the cure.